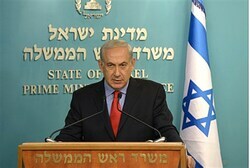 The alleged chemical weapons attack on civilians in Syria “proves yet again that we cannot permit the world’s most dangerous regimes to acquire the world’s most dangerous weapons,” Prime Minister Binyamin Netanyahu said on Thursday. “It is absurd,” he said, “that UN investigators, who are in Damascus right now to investigate the possibility that chemical weapons have been used, are being prevented by the Syrian regime from reaching the affected areas. The chairman of U.S.-based group Americans for a Safe Israel, Mark Langfan, pointed Thursday to the events of the last two days on Israel's northern border and in Syria, as proof of why Israel must never cede control of Judea and Samaria to a Palestinian state.